"The Hardest Working Band in Texas!" 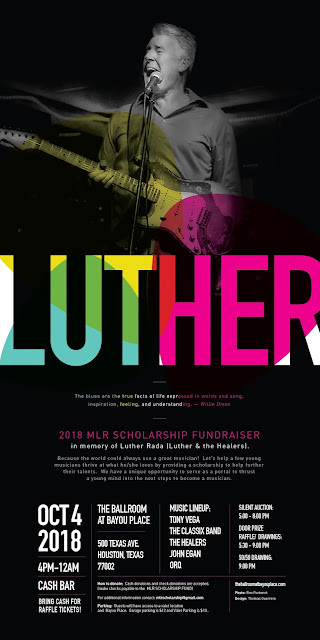 Please spread the word about the upcoming 2018 MLR Scholarship Fundraiser in memory of Luther Rada. Because the world could always use a great musician! Let's help a few young musicians thrive at what he/she loves by providing a scholarship to help further their talents. We have a unique opportunity to serve as a portal to thrust a young mind into the next steps to become a musician. 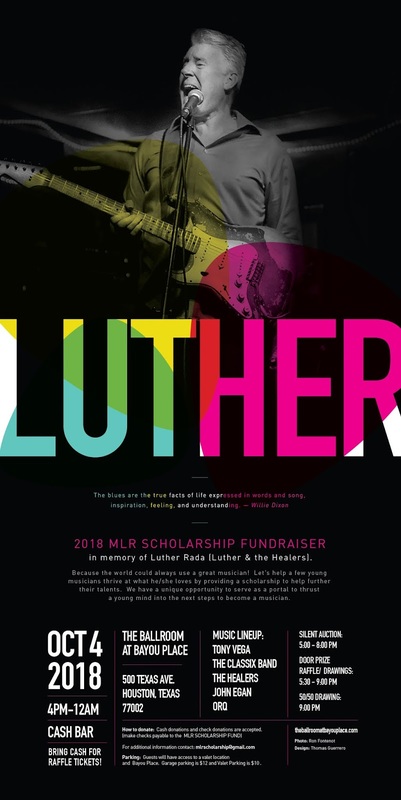 The 2018 MLR Scholarship Fundraiser in memory of Luther Rada will take place October 4, 2018, from 4:00 PM TO 12:00 AM at The Ballroom At Bayou Place, 500 Texas Ave, Houston, TX 77002. Venue Website theballroomatbayouplace.com and map to venue. PARKING: Guests will have access to a valet location and Bayou Place. Garage parking is $12 and Valet Parking is $10. Cash and Check donations may be made during the fundraiser event. Make checks payable to the MLR SCHOLARSHIP FUND. Electronic Donations to the MLR Scholarship Fund can be sent electronically through Zelle. Zelle is offered through most banks via bank website. Once logged into your account, select "Send Money with Zelle" from the menu bar, input amount, and the "contact" to send funds to is: mlrscholarship@gmail.com. If your bank doesn't offer the Zelle service, you can still make donations by downloading the Zelle app and following their instructions. Once you set up the app, send funds to: mlrscholarship@gmail.com. For additional information contact: mlrscholarship@gmail.com. Blues Club EVERY Thursday Night except the last Thursday of the month. Luther and the Healers will make your event an occasion to remember! We're available for your crawfish boil, BBQ cookoff, wedding, bar mitzvah, funeral, holiday celebration, festival, concert, bike rally, restaurant, backyard party, nightclub, corporate function and every other event you can think of! Call the Luther Hotline at 713-529-6680, or email Luther directly at LutherTX@hotmail.com. Please leave a detailed message!